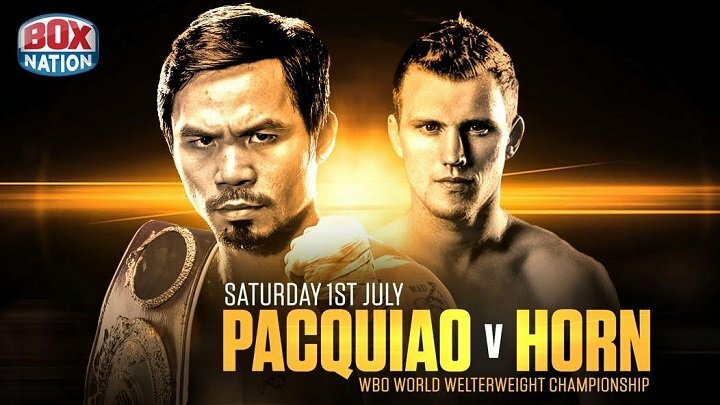 By Chris Williams: Jeff Horn surprised some fans this week when he said he was studying how Juan Manuel Marquez beat Manny Pacquiao in 2012, and he was going to use that same strategy to defeat him this Saturday night. Marquez knocked Pacquiao out cold 5 years ago after catching him with the perfect right hand to the head that put him down face first on the canvas. Horn, 29, thinks he can do the same thing when he gets Pacquiao inside the ring this Saturday night at the Suncorp Stadium in Brisbane, Australia. “We work hard for the fight,” said Pacquiao at Wednesday’s press conference with Jeff Horn. “We do my hard work in the gym. We’ll see on Sunday. I’m not worried about that. I experienced that already,” said Pacquiao in commenting on Horn’s remarks that he’s been studying Juan Manuel Marquez’s knockout of Pacquiao and plans on using elements of that strategy for this Saturday’s fight. “If he’s basing it on Marquez fight, it’s good for me. I don’t want to underestimate him. I work hard. We did sparring more than 150 rounds. I’m not thinking negative. I’m always thinking positive,” said Pacquiao. Pacquiao is a lot more careful when attacking his opponents since his loss to Marquez. Pacquiao uses a lot of feints and head movement when he does attack his opponents since that fight. However, Pacquiao does get hit occasionally when he’s on his way in. Jessie Vargas and Floyd Mayweather Jr. were both able to hit Pacquiao with good shots when he was attacking them, but they lacked the power to reproduce the same results we saw from Marquez. It takes good power to knockout Pacquiao. He’s got a pretty good chin. If Horn can’t knock Pacquiao out in this fight, it could be a real nightmare for him. The good news for Pacquiao’s boxing fans is he’s not under much threat to lose this fight to Horn. This is pretty much a mismatch involving Pacquiao fighting a guy with an arguably inflated ranking from his promoter Bob Arum’s promotional company. Horn has done anything at all to deserve a No.2 ranking by the World Boxing Organization, and unless Pacquiao gets old on Saturday night, it’s going to be tough for Horn to finish the fight on his feet. The best thing about the Pacquiao-Horn fight is the build-up to the fight. The actual fight is expected to be a mismatch. Horn is going to need to do a lot more than to try and use the Marquez blueprint for him to beat Pacquiao, because sitting back and trying to time the Filipino star for one big shot is too simplistic a game plan for it to work. That’s been tried before many times and it’s only worked once against Pacquiao. Pacquiao’s promoter Arum might continue to match him softly after Saturday’s fight. He’s interested in matching Pacquiao against Konstantin Ponomarev next in the fall. Ponomarev is Horn 2.0 in my view. He’s about the same type of fighter and the same talent level. Arum doesn’t appear to be interested in matching Pacquiao against the good fighters in the welterweight division unless their name is Floyd Mayweather Jr. That’s a fight that would bring in a lot of money ad it would be well worth it for Pacquiao to accept the fight.